Departement of Vaucluse - Pop. 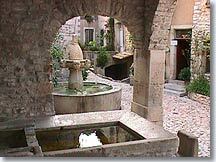 : 1.000 h.
and 23 km north of Carpentras via the D7 and then the D88. 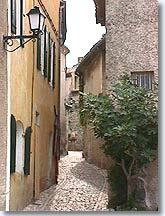 Séguret is located in the northern part of the Vaucluse, north of the Dentelles de Montmirail and west of Mont Ventoux. The village lies at the foot of a hill topped by the ruins of its feudal chateau. Séguret is one of the official "most beautiful villages in France", and thoroughly deserves this distinction. 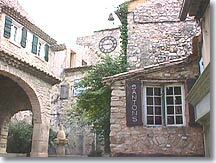 As soon as you arrive, you will be bowled over by the charm of this village, with its typical Provencal atmospherer and medieval character. You will literally find yourself in the setting for a crib, a decor naturally formed by the houses of the village. Your stroll through the streets of the village, between the grey steeply sloping lanes and noble facades, will enable you to admire historical treasures at each step: the Reynier gate, the 14th century belfry with its single needle, the beautiful 10th century Saint-Denis church, the Rue des Poternes lined with ancient houses, the Huguenots' gate, which still has its two ironbound wooden shutters, etc., etc. It's a very long list..
From the orientation table in the church square, and the Cornice of the ramparts, under the Barri, you will have a very broad view of the landscape surrounding the village; in particular its neighbour Sablet, which stands out in the middle of the plain. 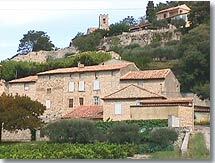 Séguret is not just a fine village, it also has land and people who produce an excellent "appellation controlee" wine: Cotes du Rhone Séguret. They are successfully continuing a wine-making tradition dating back several centuries. This vineyard covering 8 km² changed hands and owners many times throughout history, until the 12th century. The village wine-makers then decided to take control of their destiny and made Séguret a free district so that they could manage their own affairs. 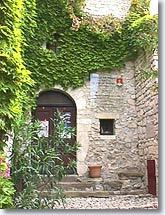 You can't visit Séguret without paying a visit to the Roaix-Séguret wine cellar (co-operative) or one of the village's vineyards ! This listed picturesque site, full of charm, attracts artists and visitors from all over the world, who sometimes become permanent residents. Everything here is beautiful, everthing is well maintained, everthing has been tastefully restored... the only down side (the ransom of success) is the crowds of visitors in the tourist season...! Ste Thecle Chapel. Reynier Gate (12th century). 14th century Belfry. 10th, 11th and 12th century Saint-Denis church. Rue des Poternes, Huguenots' Gate, the Mascarons fountain (17th century). 80m² of ground floor with 2 terraces. Sablet (3 km), Roaix (5 km), Gigondas (6,5 km), Rasteau (7km), Vaison/Romaine (10 km).